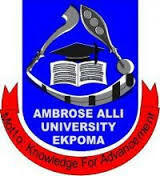 The Ambrose Alli University, Ekpoma 12th Matriculation Ceremony Schedule for Newly Admitted Part-Time Students for the 2017/2018 Academic Session. Date : Friday, 4th May 2018. All Principal Officers, Deans and Academic Directors am required to be dressed in academic robes for the academic procession. All relevant organs of the University (the Electrical Unit, Physical Planning Ceremony Committee, Security etc) are requested to take necessary action toward the success of the ceremony.